"I will not be a candidate for re-election to the United States Senate in 2020," Alexander wrote in a statement. I am deeply grateful, but now it is time for someone else to have that privilege. I have gotten up every day thinking that I could help make our state and country a little better, and gone to bed most nights thinking that I have. I will continue to serve with that same spirit during the remaining two years of my term." 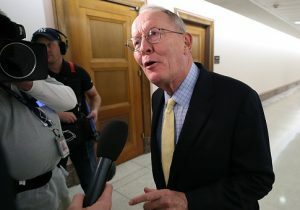 Alexander was first elected to the Senate in 2002 and is the only Tennessean to have been popularly elected both to the Senate and governorship. In 2008, he received the largest vote count ever received by a statewide candidate in Tennessee. The announcement creates a wide-open Republican primary in a presidential election year. Potential candidates included outgoing Gov. Bill Haslam (R.), Rep. Chuck Fleischmann (R.) and former Rep. Stephen Fincher (R.), CNN reports. In the most recent Senate election in the state, Rep. Marsha Blackburn (R.) was elected to replace retiring Sen. Bob Corker (R.) in 2018. She defeated former Gov. Phil Bredesen by over 10 points. Aside from being an elected official, Alexander served as President George H.W. Bush's secretary of education and president of the University of Tennessee.